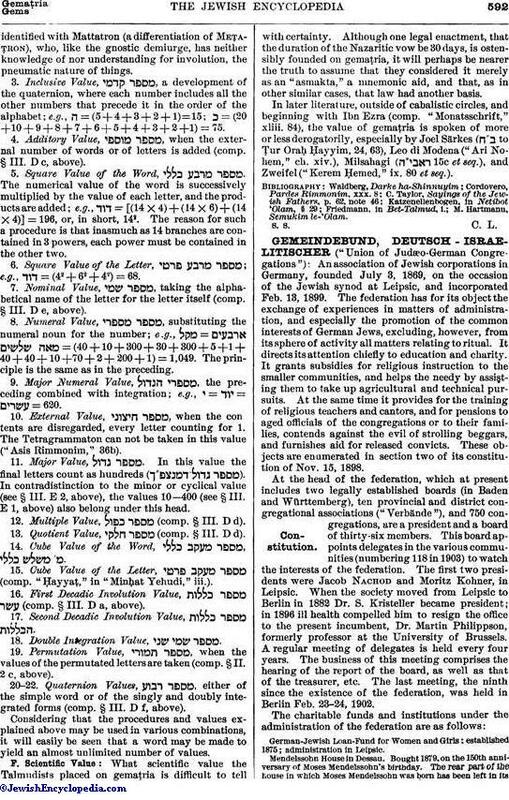 An association of Jewish corporations in Germany, founded July 3, 1869, on the occasion of the Jewish synod at Leipsic, and incorporated Feb. 13, 1899. The federation has for its object the exchange of experiences in matters of administration, and especially the promotion of the common interests of German Jews, excluding, however, from its sphere of activity all matters relating to ritual. It directs its attention chiefly to education and charity. It grants subsidies for religious instruction to the smaller communities, and helps the needy by assisting them to take up agricultural and technical pursuits. At the same time it provides for the training of religious teachers and cantors, and for pensions to aged officials of the congregations or to their families, contends against the evil of strolling beggars, and furnishes aid for released convicts. These objects are enumerated in section two of its constitution of Nov. 15, 1898. At the head of the federation, which at present includes two legally established boards (in Baden and Wärttemberg), ten provincial and district congregational associations ("Verbände"), and 750 congregations, are a president and a board of thirty-six members. This board appoints delegates in the various communities (numbering 118 in 1903) to watch the interests of the federation. The first two presidents were Jacob Nachod and Moritz Kohner, in Leipsic. When the society moved from Leipsic to Berlin in 1882 Dr. S. Kristeller became president; in 1896 ill health compelled him to resign the office to the present incumbent, Dr. Martin Philippson, formerly professor at the University of Brussels. A regular meeting of delegates is held every four years. The business of this meeting comprises the hearing of the report of the board, as well as that of the treasurer, etc. The last meeting, the ninth since the existence of the federation, was held in Berlin Feb. 23-24, 1902. German-Jewish Loan-Fund for Women and Girls: established 1875; administration in Leipsic. Mendelssohn House in Dessau. Bought 1879, on the 150th anniversary of Moses Mendelssohn's birthday. The rear part of the house in which Moses Mendelssohn was born has been left in itsoriginal condition, while the front part has been remodeled. It was planned as a home for retired Jewish scholars, and was opened in 1886. Samuel Kristeller Fund; founded May 26, 1890. Its object is to assist young Jews who wish to learn a trade, and to help deserving Jewish mechanics in settling themselves. Monteflore Fund; founded 1900. It offers prizes to be competed for by teachers of mechanical trades and of gardening. Jewish Workingmen's Colony at Weissensee, near Berlin. Its object is to provide work, food, and shelter for unemployed Jewish men. It was started in 1902, and numbers about 60 inmates. Jewish Reformatory (Israelitische Fürsorge-Erziehungsanstalt) for Boys (the Eugene and Amalie Rosenstiel foundation) at Repzin and Schivelbein; opened 1901 with twenty-five inmates. Jewish Reformatory for Girls at Plötzensee, near Berlin; opened 1902. Commission for the maintenance of indigent congregations by means of contributions to the salaries of religious teachers and to the expenses of school buildings. It at present (1903) subsidizes about 150 needy congregations. Friedrich-Wilhelm-Victoria Fund; founded (1883) under the protectorate of the crown prince and princess (Emperor Frederick III, and Empress Victoria). It maintains the life-insurance policies of 1,000 community officials. Philippson Fund; founded 1875. It affords temporary relief to needy congregational officials. Herxheimer Fund; founded September 26, 1877. Enables poor Jewish students to attend normal schools in Germany. Zunz Fund; subsidizes eminent scientific works. Historical Commission for Investigating the History of the Jews in Germany; founded 1885. It has published "Zeitschrift für die Gesch. der Juden in Deutschland" (Brunswick, 5 vols. ); Aronius, "Regesten zur Gesch. der Juden im Fränkischen und Deutschen Reiche bis zum Jahr 1273"; Höniger-Stern, "Das Judenschreinsbuch der Laurenzpfarre in Köln"; Neubauer-Stern-Baer, "Berichte über die Judenverfolgungen Während der Kreuzzüge"; Salfeld, "Das Martyrologium des Nürnberger Memorbuches." Educational Department (for discussing pedagogical questions). 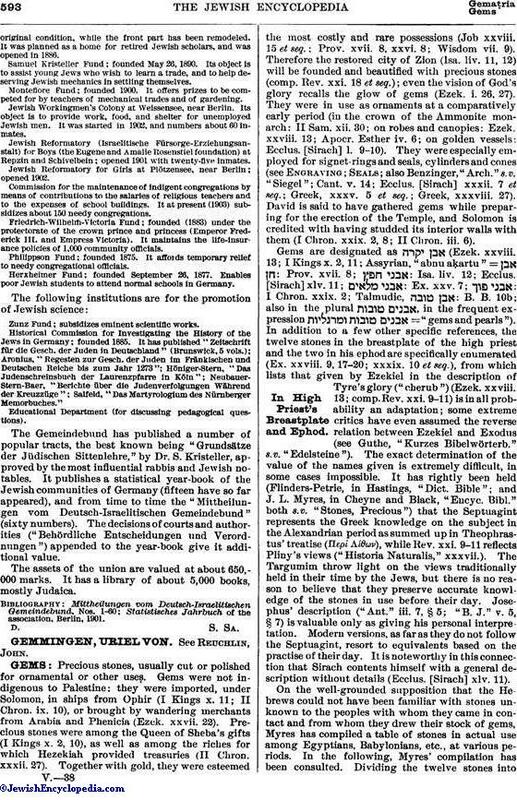 The Gemeindebund has published a number of popular tracts, the best known being "Grundsätze der Jüdischen Sittenlehre, "by Dr. S. Kristeller, approved by the most influential rabbis and Jewish notables. It publishes a statistical year-book of the Jewish communities of Germany (fifteen have so far appeared), and from time to time the "Mittheilungen vom. Deutsch-Israelitischen Gemeindebund" (sixty numbers). The decisions of courts and authorities ("Behördliche Entscheidungen und Verordnungen") appended to the year-book give it additional value. The assets of the union are valued at about 650,000 marks. It has a library of about 5,000 books, mostly Judaica. Statistisches Jahrbuch of the association, Berlin, 1901.